Today I have a card for the Papertrey Ink Make It Monday #286 - Coordinating Pairs and Fusion Card Challenge. Fusion is one of my favorite challenges to participate in and this week's challenge sent me all the way back to how I found Papertrey Ink in the first place. I started making cards in 2015 but initially, I didn't really stamp much and preferred to make them using die cuts only. As I got a little more comfortable with stamping, I started learning techniques by watching Jennifer McGuire and Yana Smakula's YouTube Videos. I was also looking at and pinning cards on Pinterest and came across this Make It Monday #98 technique video done by Betsy Veldman way back in 2012. That led me to the Papertrey Ink Blog which led me to their store. I had ordered one thing from them previously, but it was through someone's affiliate link and I hadn't taken the time to look around their store. After I found this, I became a regular reader at the Papertrey Blog and eventually a regular customer. I tried Betsy's technique one other time quite a while ago, (maybe even more than a year ago) and it was fairly successful. But I wanted to use different Papertrey products for this card. I pulled Holiday Photo Finishers (a Vault set that I bought on the Papertrey FSOT Forum), Stitched Sentiments and Graceful Greetings for the main portions of my card. I also used a couple of hearts from the Hero Arts Prayers Stamp & Cut Set. I used my Mini Misti to line things up on my cardstock so I could stamp as much as possible in one stamping. For my first card, I started with a panel of Black Chalk Paper that I got quite a few years ago from Stampin' Up. It's no longer available but I still have several sheets of this as well as an additional pack. That's probably enough to last me at least 10 years! *Ü* Betsy used Ocean Tides Cardstock for her video example but had done others on True Black Cardstock. It's been over about a year and a half since I made my card in this style so I was happy to revisit this technique now that I'm a better stamper. Both of these cards use Versamark Ink with Hero Arts White Embossing Powder. I put the left leafy branch, the Sentiment and the bottom flourish on for the first stamping, and then the right branch with the flourish above the greeting for the 2nd stamping. I don't know how Jennifer McGuire stamps 10 cards and then puts embossing powder on because even doing one card, I can't keep the Versamark wet enough to have good coverage. My Versamark ink pad is new so it shouldn't need re-inking. We run our air conditioner starting around the 1st of May (if not sooner) so that contributes to the dry air. But I would encourage you to do it however it works for you. So I stamp one side, sprinkle powder and then stamp the other side, sprinkle powder again and then heat set the whole panel. The hearts were stamped randomly by hand and heat set separately. The second card uses Ocean Tides Cardstock for the front panel and after all the stamping was complete I die cut it with the Gift Card Layers Die from WPLUS9 which is an exact 4.25 x 5.5 inch Stitched Rectangle Die. I love the finished edge that die cuts give my cardstock. Although I am very good about changing the blade in my Fiskars Trimmer, it will just never be as crisp as a die cut edge. The Chalkboard Paper was also die cut using the same die. To get the "chalky" look on the cardstock, you can use white pigment ink very lightly on a paper towel or small sponge dauber. I did use this method on the black card, but for the Ocean Tides Card I notice that the powder I use for my powder tool looked really how I wanted it. So that it would brush off I gave it a good mist with some hairspray but I think I'll get a can of the cheapest hairspray I can find next time I go to Walmart. My Bed Head Hair Spray worked great, but it's too expensive to use on cards. I like the results of the powder tool so much better and I wanted to keep that look. I use a 1 inch watercolor wash brush with baby powder for my powder tool. I like it better than an embossing buddy or the EK Success Powder Tool and my bristles aren't breaking off my brush. With the large size of the brush, it's also much faster. Again, it's one of those things you have to decide what works best for you. I'm simply giving you another option to try. Baby Powder or Cornstarch are much silkier feeling than the chalky tools of so many other options. Other than that, I did this technique exactly like Betsy showed in the video I linked above, including the sketchy look around the edges that was added with a ruler and White Prismacolor Pencil. Mostly I have Polychromo Pencils, but I do have a couple of White Prismacolors for adding highlights or whatever to cards. I also have a few other stamp sets that I think would work really well for this technique the next time I need one. I also used a Mini Round Ink Blending Tool with True Black and Ocean Tides around the edges. At the time Betsy did her video, I don't think the Mini Round tool was out yet. As you can see, the challenge of Fusion combined with the Papertrey Ink Make It Monday #286 Challenge resulted in this pair of coordinating cards. Thank you so much for stopping by and spending a bit of time here today. 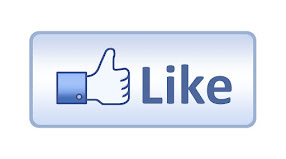 I love reading your comments so please don't hesitate to leave one for me. 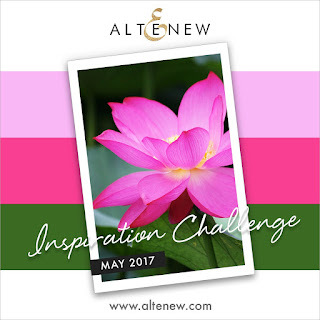 The Card Concept Challenge #74 is this beautiful inspiration photo. 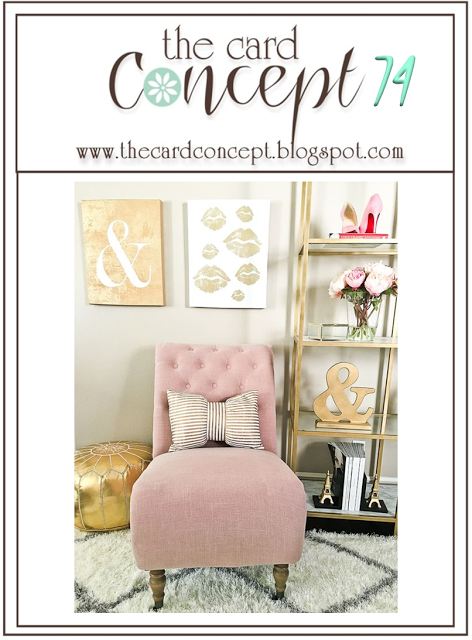 I love the touches of gold with the pretty pink objects throughout the room which determined my color scheme and the Eiffel Tower bookends made me want to do something with a slightly Parisian feel to it. I started by dry embossing a panel of Sweet Blush Cardstock with a Tim Holtz Eiffel Tower Embossing Folder. I went over all the raised area with some Tonic Nuvo Embellishment Mousse in the color Indian Gold. The Embellishment Mousse is really easy to apply with your finger (or your gloved finger) and much easier to control how much you are putting on paper. I love it and it was very easy to use to give that panel a distressed look without the whole panel becoming gold. 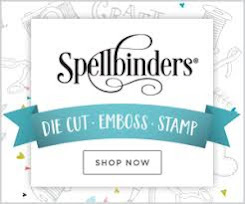 Once I had that done, I die cut it with the largest Simon Says Stamp Stitched Rectangle Die. For the Sentiment and the Mat, I used Papertrey Ink's Gold Luxe Cardstock. The Gold Luxe Cardstock is really nice, photographs well and was the perfect match for this project where I would be die cutting my sentiment. Papertrey also has a Silver Luxe Cardstock. It was important to me for it all to look the same. I adhered it all to a top folding card base made from Stamper's Select White Cardstock. 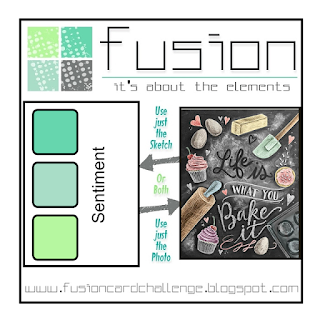 The mat I used is from a new die collection that I got just this week and is the WPLUS9 Gift Card Layers Die. I've been thinking about getting this die for a while and now that I have it, I wonder what took me so long! It's a pretty basic one that I will use all the time. The largest die in this set is in perfect proportion to be a mat to the largest Simon Says Stamp Stitched Rectangle Die. It is the exact size of an A2 Card Front. The sentiment on this card is from a few different dies. I used Avery Elle's Simply Said Love Die, Concord & 9th's Beautiful You Die and the Simon Says Stamp Mini Hearts Die. Be sure to stop over at The Card Concept Challenge Blog to see all of the inspiration from the Design Team and we hope you'll join us for this challenge. You have two weeks to join in the fun! I have a card for you today that I am entering into the Altenew May 2017 Challenge hosted by May Park this month. I have been very slow to get an idea for this challenge which is just how it goes sometimes. In case you don't know, Altenew has a special release each month on the 15th called Build-A-Flower and each month has a new and different bundle. The bundle includes a 6 x 8 Layering Stamp Set and the coordinating die and can only be purchased in this special grouping. Neither the stamp, nor the die, can be purchased separately. When I saw the Build-A-Flower Magnolia Set for this month, I knew I would use it for my card. It normally doesn't take too long for my order to get here and it only took about three days this time. Honestly, I was planning to watercolor this image, but once I got it embossed I wanted to test it with the layering stamps and that sold me on just stamping it. I will watercolor it some other time. I stamped two of the images in Versamark on Watercolor Paper and heat embossed them with Antique Gold Embossing Powder. One of the reasons that Altenew Stamps are so popular is that the consumer has the option of coloring in the image however they want; stamping, markers, paints, colored pencils which leaves you a whole bunch of options. I like that I can make every card a little different from the previous one. Using the inks from Altenew's Rose Petal Collection which is available in regular sized pads and in the Mini Ink Cubes although that collection is sold out right now. I stamped the layers in Rose Quartz, Puffy Heart and Purple Wine. I used Mocha for the branch and Frayed Leaf with Forest Glades for the foliage. The banner sentiment is from Altenew Beautiful Day and is one I use often and stamp several of at once so I have them ready to go. Once the flowers were stamped and die cut, I really wanted to go for the deep green like the background of the inspiration image. I dry embossed a panel of Pinefeather Cardstock and then using Tonic Nuvo Embellishment Mousse in Indian Gold, I rubbed it onto the background panel. I tried to hit all the high spots on that panel. This dries instantly since I was using such a small amount. When that was done, I die cut the panel with a Stitched Rectangle Die and mounted it to a top folding white card base. I put foam tape on the back of my flowers and mounted them to the background panel. I have to say, I am really happy with how well this card turned out and I hope you like it as much as I do. 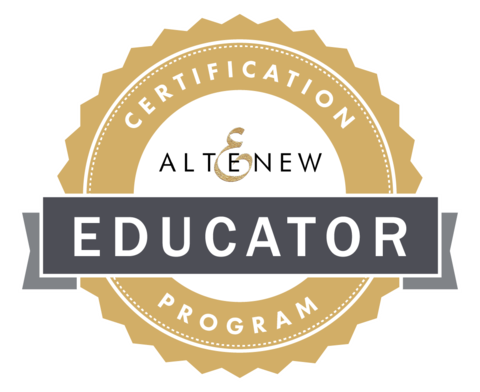 Be sure to stop over to the Altenew Blog to see all of the entries there. There are always so many talented people entering the challenge. Thanks so much for stopping by today. I hope you'll leave a comment so I can also visit your blog! Hello everyone! 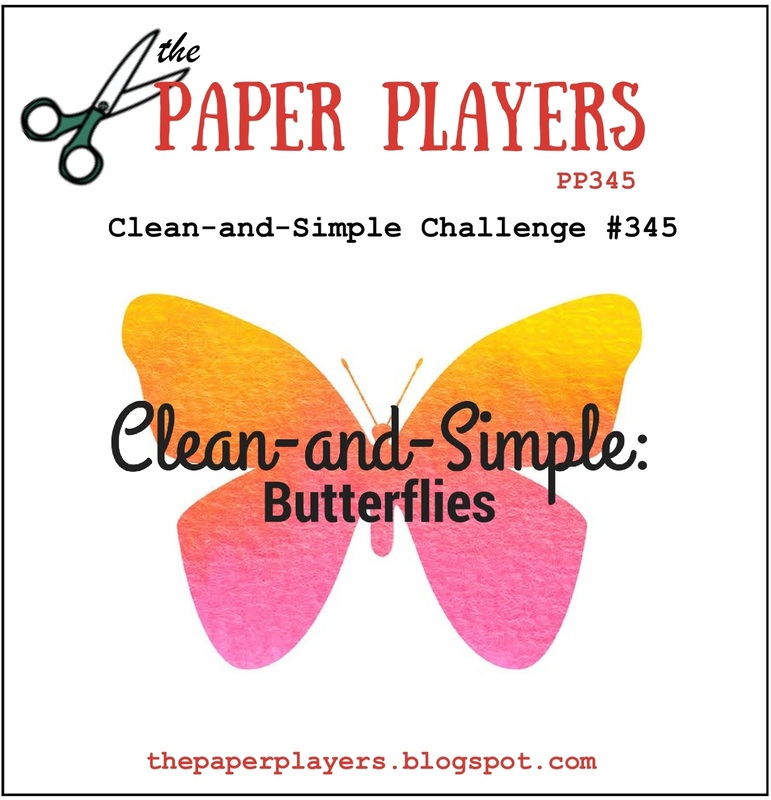 I have a quick card for The Paper Players Challenge this week. We are to create a Clean & Simple Card that has Butterflies on it. If you've been here before, you know that I have butterflies so it was easy to decide that I'd participate. The ones I used for my card today are a set a got a while back but had not used before so I thought it was high time to ink them up. 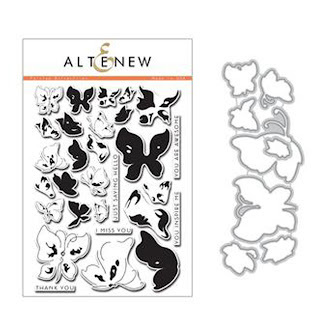 Recently, Altenew offered their Painted Butterflies Stamp Set and Coordinating Dies for a special price that was approximately a 25% discount, so I got this set that I'd been wanting for a while. There are 29 individual stamps included in this 6 x 8 stamp set and some of them are sentiments. The style of this set is looser than most of the styles I have, so there's not perfect way to stamp them. The outline does not match up to the inside layers so it's a much more organic feel to these beauties. A layering guide is available for download or just for reference at the link provided. For my butterflies, I began by die cutting them from white cardstock - One of the larger ones and a couple of the smaller ones. Then I popped them back into the negative for stamping. I prefer to stamp the most solid image first and then the outline. I used Altenew's Lagoon Crisp Dye Ink for that and then stamped the outline using Altenew's Jet Black Crisp Dye Ink. Once that part was done, I misted them with some Sheer Sparkle Shimmer Spritz and set them aside to dry for a few minutes while I did some ink blending on the background panel. I used Papertrey Ink's Aqua Mist Ink with a Mini Round Ink Blending Tool and more of the shimmer spritz. When that was dry, I die cut the panel with the largest Simon Says Stamp Stitched Rectangle Die, and cut a mat using the largest die from the WPLUS9 Gift Card Layers Die Set out of Hawaiian Shores Cardstock. I attached those to a top folding card base made from Stamper's Select White Cardstock using the Kokuyu Dotliner Adhesive. I stamped my greeting from the Hero Arts Hello Stamp & Cut Set in Versamark and heat set it using Simon Says Stamp Antique Gold Embossing Powder. After that I could add the butterflies with some foam tape and I also added three little crystals (I buy Swarovski when they are half off at Hobby Lobby) so I can participate in the Simon Says Stamp Wednesday Challenge, "A Bit of Sparkle". 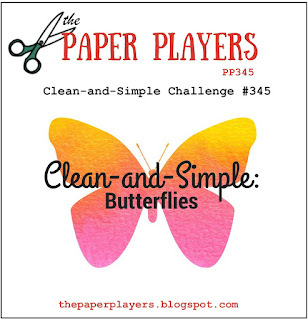 I hope you'll be able to join in on the fun at The Paper Players this week! I love seeing how other people interpret the challenges. I hope you'll leave me a comment so I can check out your blog as well. Thank you so much for stopping by. Last week, I did a post (here) featuring some cards I had made using a product that I got for another purpose; changing the color of something metal. But the packaging said the product worked on paper and since it looked and worked similarly to Tonic Nuvo Embellishment Mousse, I wanted to get some of the mousse and do a product comparison for you. I made a card out of the test piece so I am entering this card in the Simon Says Stamp Wednesday Challenge and entering a second card at the AAA Card Challenge. The two products look very similar and have the same consistency. The biggest difference I found was that the Embellishment Mousse is Water Based and you can add a bit of water to thin it out if you like. I haven't done this yet. The Metallic Lustre is a wax based product and is quite a bit heavier, making it harder to control where you are putting it. I really like the Embellishment Mouse (seen here in the color Indian Gold) and found it much easier to apply to the raised surface. It is lighter and and looks a lot less heavy handed. Since this product was specifically made for paper, I'm sure I will go forward using the Mousse. I had much better control over where I was putting the product and over how much product I was putting down. While I like the card I have today, I should let you know that I tried some other embossing folders but found the results not very satisfactory at all. To get the nice even distribution of the embellishment mousse, the design needs to be close together and continuous. The method of application was the same as last time; a rubber glove. I buy them by the box at Sally Beauty Supply for occasions that might get messy. You can use a soft cloth or probably even a bit of paper towel to apply this. I haven't tried it with an Ink Blending tool as of yet because the rubber glove is working for me so far. 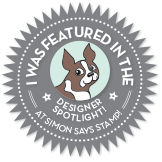 For today's featured card, I started with a panel of Simon Says Stamp Mint Cardstock. I dry embossed it using an Anna Griffin Embossing Folder. Using just my index finger, I rubbed the Tonic Nuvo Embellishment Mousse all over the raised areas of my card. I felt that I had much more control with the Embellishment Mousse than I did with the previous product. Tonic Embellishment Mouse comes in 24 different colors so there's something for everyone. You can also use the embellishment mouse to "paint" with by adding a bit of product and a mist of water to an acrylic block, mixing it up and then dabbing your paint brush in that. I don't have any examples to show you as I was just experimenting on some scraps, but you can do it. I like the feel of the mousse and the price point is identical. I used a coupon for the Metallic Lustre at Hobby Lobby. Since I got the Metallic Lustre for something not related to paper crafting else, I'm glad I tried it out on the paper, but I like the product meant specifically for paper better. At this point I don't really see me purchasing other colors in this product, but you never know. I know what to expect from it now so it will be interesting to find all the ways it can be used. To finish up my card, I misted the panel with some Tsukineko Sheer Sparkle Shimmer Spritz and let it dry. Next I used a Simon Says Stamp Stitched Rectangle Die in the largest size to die cut the embossed panel, adhered it to a top folding card base made from Stamper's Select White using Kokuyo Dot Adhesive. The design of the embossing folder had the 4 little dots in it so I adhered 1 little crystal on each of the dots. I use Ranger Multi Medium Matte to adhere them. The Butterfly die cut is from Concord & 9th Floral and Flutter Dies. The sentiment is one of many that I had ready to go ahead of time. This is a very clean and simple design that packs a lot of bang for the buck. 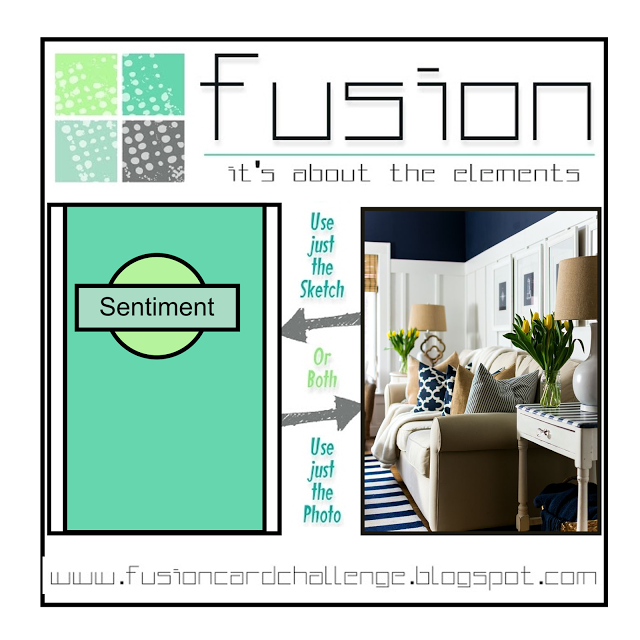 Welcome to a new post for The Fusion Card Challenge. 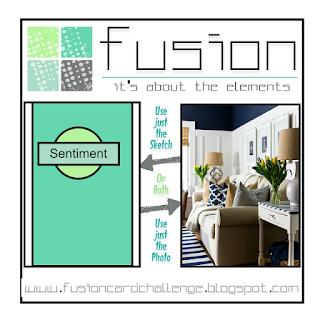 I was inspired by the bold pattern of the Navy & White Pillow on the sofa and also partly by the sketch. If you rotate the sketch 180 degrees, then I'm pretty close. Navy and Gold always works nicely for a masculine card and I love this patterned paper with the gold foiling. Because I only use a quarter sheet of patterned paper at a time, this pad of paper has already lasted me a long time and I still have lots left. This particular one came from the 8.5 x 11 Be Bold - Be Bright Collection from The Paper Studio which is Hobby Lobby's in house brand. All of these papers have gold foil on them and come in a variety of patterns and colors. To capture the feel of the sketch, I wanted to use some of the things I see in it as well including a horizontal banner, and a vertical design element. I have two postage frame dies and even though they are two different brands, the smaller Papertrey die (from the Make-It Market Post & Parcel Kit) and the larger Avery Elle die work awesome together. I wanted that gold edge along the outside of my postage stamp so I just tried it and I was pretty excited when they worked together. The large "Wish Big" sentiment is from Papertrey's Big Basics Die Collection. 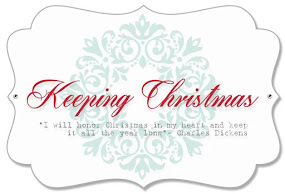 There are several sentiments each sold individually so you can pick and choose which ones you like and will use. With masculine cards, I like to keep the focal image front and center but I felt the Happy Birthday banner added a nice touch to the Stamper's Select White card base, pulling the whites together. This is a super simple card for this challenge and the only thing stamped was the banner that I had done with several others previously. Everything else is a die cut. I am really happy with this design and plan to use it in the future. Have a great day and be sure to check out all the entries and Design Team Inspiration at The Fusion Card Challenge Blog. Hello there! It's time for the Papertrey Ink Create Along With Us Monthly Feature. The idea is to be inspired by one of the projects we've seen during the May 2017 Release Announcement activities. The release is now available in the Papertrey Store. 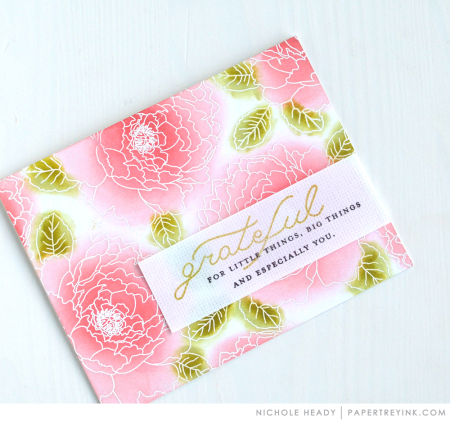 I was inspired to create a card based on Nichole's project seen here on the left. This is created with a new Stamp and Die Set called "Especially You" that's been designed by Nichole as well. The flower in this set is quite large as you can see and it reminds me very much of one that Nichole designed previously call Botanical Blocks II. That one is a smaller scale, but I've used it quite a lot so it will be nice to have a similar look in a larger size. Besides the floral images, there are also a number of greetings and sentiments included in the set. For my card, I used similar colors to Nichole's with some pinks and greens. I also added a touch of pale blue for the "Sky". I started by heat embossing the Botanical Block onto Watercolor Paper and heat setting it with Simon Says Stamp Antique Gold Embossing Powder. I water colored the bloom using a Zig Clean Color Real Brush Marker in Light Pink but for the leaves, I used a May Green Marker without any added water. For the sky, I used Light Blue and mixed it with a bit of water. The Postage Stamp style frame is cut from Gold Foiled Cardstock. You can see a bit of the gold in the reflection but it looks black or dark brown in the photo. I also made a second card painted in the same way but with some colored cardstock which I don't do very often. I like the clean look of White on White but I wanted something that was a bit of a different look to send to a friend who loves color! The bloom looks a little bit washed out with my lights but it isn't in real life. I used the Noted Scalloped A2 Vertical Dies to create the Lovely Lady card base and the New Leaf Mat. This card making journey seems to be ever-changing for me. There's always new techniques, mediums, products etc. for me to try. Heat Embossing with Watercolor remains my favorites. Thanks so much for stopping by today. Be sure to go over to Nichole Heady's Blog to see all of the products that were released yesterday. 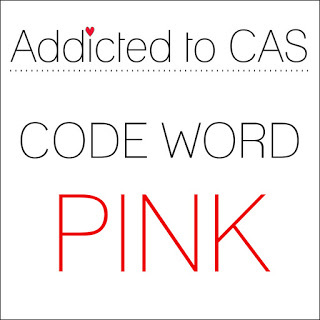 This morning I have a card made for the AAA Card Challenge #90 - Embossing and Addicted to CAS Challenge #111 - Code Word Pink so I thought I would combine the two to make my card today. I made a card this morning using the same technique (called Distressed Elegance) I featured here on my blog since all of that is still sitting on my desk. I love the combination of Pink and Gold, no matter which color of pink it is. Since this was simple and both of the challenges focus on Clean and Simple Cards, I just rolled with it. I still have several panels of 4.25 x 5.5 inch cardstock sitting on my desk. I primarily use color for background panels so it seems I always have lots of these. I have a folder next to my desk that I keep anything smaller than a half sheet in so I can check there first if I need or want a certain color. 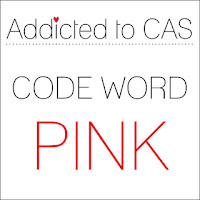 This particular shade of pink happens to be Papertrey Ink's Lovely Lady Cardstock. This is definitely a cool pink color, but it's quite vibrant. I used dry embossing for my background and heat embossing for my sentiment. The Embossing Folder is Anna Griffin's Pirouette. I've had mine for a while but I checked and you can still get one on Amazon. You could also check Hallmark Scrapbooks and Crafts or Scrapbook.com. I die cut the panel using Simon Says Stamp Stitched Rectangle Dies in the largest size. The sentiment banner is from Tag Sale: Quilted and the sentiment is a stamp from Botanical Blocks, both by Papertrey Ink. The butterfly is from Concord & 9th's Floral & Flutter Die and is my second favorite butterfly die. This was a super fast card in a perfectly CAS Style. I hope you enjoyed it and that you'll come back soon. I promise to move on to a new style of card today! Today's cards are some I made for the Simon Says Stamp Flickr Challenge #71, "Favorite Technique". I would have to say Heat Embossing is my favorite technique and expands into all of the ways it can be used from simple to complex. I love to heat emboss with Simon Says Stamp Antique Gold Embossing Powder which is my favorite because it's a warmer tone than regular gold embossing powders. The only part of heat embossing I haven't mastered is combining it with Masking. Those sticky little masks leave residue on your cardstock which embossing powder loves to cling to. I have yet to get a clean image when attempting to combine these two things. If there's a trick here I am missing, be sure to leave me a comment and tell me what it is because I use heat embossing on almost every single card I make. It's the look I love. As long as you are consistent about using your powder tool, you'll get good results. This card uses heat embossing in it's most simple form which is to stamp and heat emboss a sentiment. I often stamp and heat emboss generic greetings onto the little banners of black and white cardstock so they are ready to go. I send lots of just a note or thinking of you type cards so I can always use these types of greetings. For the rest of the card, what started as a make-over for something else became a cool new technique for my cards. My Sister-In-Law, Vickie, has a restored Victorian Era Farmhouse with a formal parlor and dining room. I'm telling you this recollection from memory (so I hope it's correct), but those areas of her house have some textured wallpaper that has had some kind of gold "rubbed" on it in this kind of distressed fashion. While the other project I was working on didn't really work out how I wanted it to, the packaging says it works on wood, metal, paper, etc. .... so you know I had to test it out on some cardstock. I knew I wanted to try it with an embossing folder and this particular one reminds me of that wallpaper in Vickie's house. Once I had the gold rubbed on there, it reminded me of it even more and I loved the look. So while this card is simple, I think it is also ultra elegant. For this second technique I used today, this is how it started: I have a small bronze Eiffel Tower that I use as a prop in most of my photos for social media such as Instagram and Facebook along with a small, fancy, little pair of scissors with Gold Handles. I am pretty neurotic, so it bugs me that that the gold on the Eiffel Tower and the gold on the scissors is not the same gold. I went to my local Hobby Lobby in search of an inexpensive way to change this. I wasn't sure what to try but I had a few things in mind. This white cardstock was the first test I did for this technique. While it has too much product on it, you can see how opulent and shiny it is. It's like gilding in a jar - incredible! Way back in 1996, the company I worked for in Topeka, Kansas built a new national headquarters and my boss and I were in charge of that project. One of the big things for the board room in that building was that Gold Leaf was applied to the ceiling. There was tall scaffolding all the way up to about 2 feet from the ceiling. The workers laid on their backs, working with what was about a 4 inch square piece of gold leaf on some type of substrate that they applied to small sections of the ceiling at a time until the ceiling was completely covered in Gold Leaf. It was tedious and took several days with two workers. The end result was quite stunning. I knew that you could get Gold Leaf Sheets at Simon Says Stamp, but I also wanted to see what my other options were. When I got to Hobby Lobby I went to the area where the spray paints are and figured that would be a good place to start. To make a long story short, after asking the lady in charge of that department, I decided on a product called Metallic Lustre in the color Gold Rush. This is a wax based product that you rub on and keep rubbing until you get a gold shine. The effect is permanent. While I'm not too keen on how my Eiffel Tower looks now, it was such a cool product and it reminded me of Tonic Nuvo Embellishment Mouse. I think this product is pretty similar but I did order some of the embellishment mousse for a comparison and will let you know the results later. Nuvo Embellishment Mousse is around $8.00 a jar and contains 2.2 oz. of product. Metallic Lustre contains 1 fluid oz. of product but the jars seem the same size based on photographs. It costs $7.00 and I used a 40% off coupon for it. I'll have to let you know later how size, quantity, texture and all of that compares. To apply this product, I wore a rubber glove. I buy a box of gloves at my local Sally Beauty Supply for messy jobs such as polishing shoes, hair color or any occasion such as this. I tried a soft cloth first but I didn't have as much control for applying the product and liked the rubber glove better. As you apply this product, you just keep rubbing until it turns shiny. It only took seconds for this to happen. I did find that you have to be very light handed and careful when applying this to paper. It's is very easy to overdo how much product you are using. There were a few pieces of cardstock I had to trash but I practiced on scraps to begin with so it was no big deal. I liked so many of the ones I made, that I turned out about 10 cards really fast. I was sending some cards to Vickie and another friend that had asked for some, so it was nice to include these in there as well. I cut the background panels with the largest Simon Says Stamp Stitched Rectangle Die and used gold foiled cardstock for the leafy branch (Spellbinder's Romantic Vines) and the Fancy Butterfly (Impression Obsession and my very favorite) butterfly to tie everything in with the background panel and the gold sentiment on the banner. It's hard to capture how pretty this is in photographs, but give it a try and you'll see what I mean. I tried this technique with a variety of embossing folders but I found that the Victorian Styled Anna Griffin ones were the style I liked best. The lines of the embossing are very delicate and that particular characteristic seems to work best with this technique. I have a couple of those but you'll just have to try what you have. I cannot stress the importance of a very light touch. Just the barest hint of product on the tip of your finger is all it takes. You can add more, but you cannot take away with this product. I also tried this with a Mini Ink Blending Tool, but there was still not enough control for the light application that's needed. I suggest trying with whatever embossing folders you have in your stash and getting a feel for which ones do and don't work. I hope you enjoyed this technique and I will be sure to share more information on the Tonic Nuvo Embellishment Mousse as soon as I receive it and can compare the two products. I was thinking before that those mousses were in the "nice to have" category and now I think I may need a few more colors sometime. Thanks for sticking with me this long. If you try this out, I'd love to hear your results! Your sweet comments continue to be an encouragement to me! 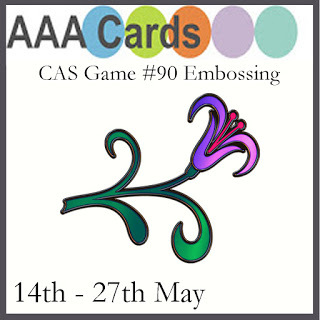 Today I have a card for the AAA Card Challenge #89 which is a CAS Challenge with a theme of Bright and Beautiful this week. 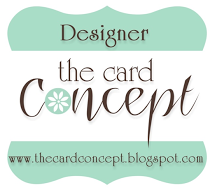 That means that your cards needs to have clean lines and lots of "white" space with minimal layers or embellishment. I actually make quite a few cards in this style so that when I give them away, they are good for mailing without extra layers or extra postage. While I love the look of well done shabby chic style cards, I can rarely pull that look off so a clean and simple style suits me well most of the time. In my efforts to get back in the groove of work this week, I made an attempt to get some things off my desk. I had stamped this Kind Soul Stamp on a watercolor panel several weeks ago when I first received it, but it's been sitting on my desk ever since. Right now, I seem to be in the mood to watercolor but like everything else, it goes in stages. This is a WPLUS9 Design from Dawn Woleslagle and she has done all the hard work for us by creating this stamp in a bouquet that will fit vertically or horizontally or anything in between on a card front. There is also a coordinating die. This is good since I like to heat emboss and it's a lot more difficult to keep your embossing clean when you are also doing masking. I'm not an artist and I don't have an art background so leaving white space is harder for me than it might seem. It's a struggle to control how much water you are using and how much color, etc. I really struggle with leaving some of the white showing through on my petals and such, so I practice although I don't know if that is helping me get better. If it's presentable is the main thing I care about and it doesn't matter to me if it's technically correct. The moral of this story is to keep trying. I have a long way to go but I think this was an improvement for me. To color my image today I used Clean Color Real Brush Markers in Persian Blue, Deep Green and Violet. I used my favorite greeting from Altenew's Beautiful Day and stamped it in Versamark on the black Number the Stars Banner then heat embossed it with Simon Says Stamp Antique Gold Embossing Powder which continues to be my favorite gold. With the black centers on the anemones, it was the perfect finishing touch. Elaborate can be pretty, but making cards has taught me an appreciation for simple elegance as well. Today is the day for a new challenge to begin at The Card Concept! This is Challenge #73 and our theme is "Vintage Notes". I made my card a few weeks ago as soon as I got my Papertrey Ink 2017 Anniversary Set called "Grand Finale". The way I used it today, I did not need a die, but the coordinating dies are scheduled to be available with the May Release on the 15th. I love the look of this set and I know it will be great for so many occasions including Anniversary and Birthday Cards. You could stamp or add die cuts for whatever number birthday or anniversary it is in the opening. I look forward to using this set more! I wanted to keep my card very vintage feeling today with only the hint of color in combination with the Charcoal Grey and White. I used Sweet Blush Cardstock for the solid layer of the butterfly. The background paper is almost the very last I have of that pattern but as soon as I saw the Anniversary Set, I thought how great it would look together. It is a sort of Eggshell White Color with a deep grey print which was a perfect match to Papertrey Ink Rustic White Cardstock. Grand Finale is the 2017 Anniversary Set from Papertrey Ink. You can't purchase it, but you can redeem your points for purchase. You accumulate points based on purchases. Dies are not currently available, but are supposed to be available during the May Release. I die cut the background panel with the largest Simon Says Stamp Stitched Rectangle Die. Next I stamped the square shaped box rotated 45 degrees to make the diamond shape. I think the diamond fits in better than the square shape with the background paper and I like the versatility of rotating to get whichever look you want. I stamped in Versafine Onyx Black (twice in my MISTI because the background paper is very textured) and then heat embossed with Clear Embossing Powder from Simon Says Stamp. To bring the diamond shape forward in the design, I cut a True Black square using Limitless Layers 1½ Squares and the interior square from my patterned paper. I mounted the black square using Foam Tape and adhered the patterned paper square using Thin 3D Foam Squares. The Butterfly was cut with some Charcoal Grey paper that was a scrap from another project with the Sweet Blush behind it. The "hello" sentiment is from the Hero Arts Hello Stamp & Cuts and was cut from Smokey Shadow Cardstock twice, then glued, one on top of the other. Once that was dry, I smooshed Versamark over the top of it and heat set it with Ranger Liquid Platinum Embossing Powder, repeating that two more times. It gives the look of a metal embellishment. For a final touch, I put three little jewels on the butterfly body and one just underneath the "hello" sentiment. I know they are hard to see here, but in real life, they do really sparkle because they are Genuine Swarovski Crystals. I've started using a few of these on special cards. I buy them at Hobby Lobby when they have the 50% off sale and attach them with Ranger Multi Medium Matte. I think this is my favorite card that I've made in a while. I know my daughter will love it when I send it to her. It's very understated but super elegant and the crystals are just the perfect thing to finish it off. Be sure to hop over to the Card Concept Blog and see all of the inspiration from the Design Team! We hope you can join us for this Challenge. Thanks for stopping by today! I was gone for a few days to a wedding and it is always hard for me to get back in the swing of work when I take a few days off. So today I made something that didn't take much time at all. I wanted to use some elements that I had already stamped and were ready to go and combine them with Melissa's technique from this week, Background Stamping With Sentiment Stamps, Make it Monday #284. I wanted to use one of the colors from the tulips I had already stamped using Tulip Time Stamps and Dies to help incorporate more of that color into the background panel. I chose the Brilliance Pearlescent Coral Ink. You may remember that I used Pearlescent Coral, Berry Sorbet and Pure Poppy for stamping these earlier and you can read more about it at my post here. The background sentiment, "sending paper hugs since I can't be there to deliver the real thing" is from the Pen & Ink Stamp Set set designed by Nichole Heady and was released last month. I hope you will have time to participate in the challenge. Be sure and stop by the Papertrey Ink Blog to watch Melissa's video if you haven't yet seen it. Have a great day my friends! Hello there! I have a few cards made for the Papertrey Ink Make it Monday Challenge #283 this week which features a Watercolor Wash Background. Laurie Schmidlin did her first Make It Monday Video since joining the Design Team at Papertrey Ink. You can see her video tutorial here. I've done this technique before, but it's been a while and I had forgotten how much I enjoyed seeing the end result of the watercolor part. Especially since I like to add in a "twist" by using gold watercolor from my Finetec Palette once the color is at least partially dry from the first round. This makes some pools in the watercolor and gives you some hard edges on the watercolor paper which resembles veins like you might see in marble. It's really a nice option if you like to use gold, which you know I do. I'm not going to spend a lot of time here telling you how I created these backgrounds because you can pop over to the Papertrey Ink Blog and watch for yourself. I used my Kuretake Gansai Tambi Watercolors in #42 Yellow and #34 Dark Pink Watercolors as well as Arabic Gold from the Finetec Gold Palette for this first one and Yellow and Red for the other one. I first learned this technique from Jennifer McGuire but it's been well over a year since I have used it, so it was good to use some supplies that sit on my desk all the time but only get used occasionally. I used Arches Hot Pressed Watercolor Paper for the cream colored background and Fabriano Artistico Extra White Watercolor Paper for the whiter background. While the Canson Bristol is my favorite for water coloring floral images, it doesn't really hold up to the amount of water you need to create watercolor washes so I have other types around for just this reason. And for the amount of water it will hold and stay smooth, Arches Hot Pressed is my favorite. I wish they had a whiter brighter paper but I've not seen one so far. I love how the pink one came out and it is my favorite. After I trimmed down my panel with a stitched rectangle, I lost one of those veins that I like so much but there is still one left that is really visible. Since we are attending a wedding in Texas this weekend and I have been working on a scrapbook album for the bride, I have lots of love themed things still laying on my desk. I thought that I would make a card to tuck into the album so I die cut the Love Text Block from Gold Paper to match my Gold Watercolor. Since the text block has a lot of open space, it was the perfect fit to show off the watercolor wash in the background. My husband's favorite color is Orange, so I am planning to give this one to him at the start of our "Weekend Adventure". Traveling anywhere with him is always an adventure and not always one that is fun. Sometimes I just want to get there without the adventure but I'm trying to be a good sport about this one because we have plenty of time to get there. So, a little side adventure won't be any big deal. 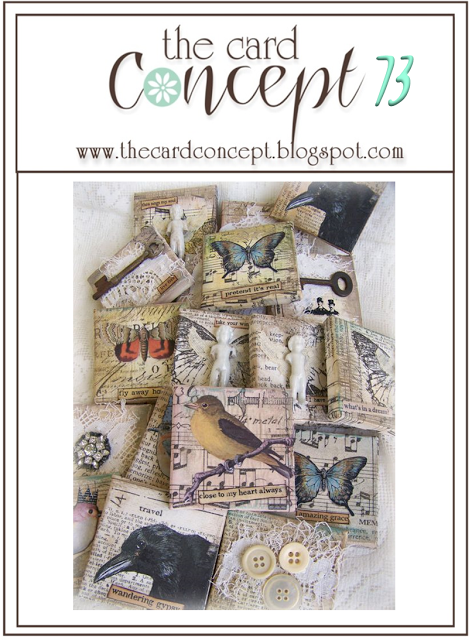 Thank you so much for stopping by to see my cards for this week's Make It Monday Challenge. Have a great weekend everyone! 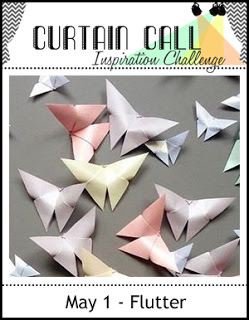 I am popping in with a few quick cards today for the Challenge at Curtain Call. This week the challenge at Curtain Call is "Flutter" which to me always means butterflies or "flutterbys" as I called them when I was young. I love butterflies and the imagery that just hearing the name invokes. It's kind of like what happened earlier this week. After weeks of rain, it was so nice to wake up Monday Morning and hear the birds sing and see the sun shine! Now we've had storms again since last night with lots of rain. In fact the rain was beating so hard against the windows in the night that it sounded like hail, but it was really only rain. Unfortunately, that was at 3:30 this morning and the dogs even woke up scared so I've been up for several hours already. 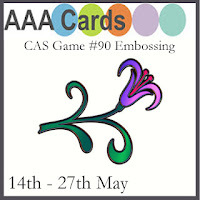 Anyhow, I wanted to stamp a couple of the floral branches from Altenew's Extra Special Stamp and Die Bundle. Lately, Altenew has been having some great bundles at a great price. I subscribe to their newsletter to get notifications of sales and blog posts so I picked up the Painted Butterflies Bundle last week for about 25% off the retail price. The stamps and dies are available separately, but I try to always get the bundle because you get a price break vs. buying the items separately and because I have Rheumatoid Arthritis, it's much easier for me to use a die rather than try to fussy cut them. I love the precision edge that using a die gives me. Since I had already gotten the MISTI out to stamp, I just went ahead and cut several of the white die cuts to make a few more of the floral branches. This is a multi step layering image, so that's kind of the way I have ended up doing things much more lately. If I stamp and die cut one thing, I might as well do a few more while I have everything out. If I don't make cards from all of them right away, I just store the pre-stamped ones in the stamp pocket with the stamp and die set so they are all ready the next time I want one or need a fast card. For today though, I made all of what I had into cards. Most of the cards I send are "Just a Note" or "Thinking of You" types of cards and I try to have sentiments stamped, heat embossed and ready to go as was the case today. I did a whole bunch of these this week while my hubby was working on my computer but I have already used several of them and have plans to make quite a few more today and tomorrow. Since hubby is still trying to figure out what is going on with my computer, I'll likely have time today to die cut more banners and get them stamped and ready to go. One of my favorites is a sentiment from Altenew's Beautiful Day Stamp Set that says "Wishing You the most Beautiful Day. It takes a different type of banner but it's another one that I really like to have on hand. I keep these banners in a zippered baggie on my desk. Then whenever I am pulling a card together, those are my go to. If I need something else, I'll stop to get a different sentiment and stamp it on my card or on a banner, but the ones mentioned above are my most used so it's a no-brainer for me to have some ready to go. One of the things I most like about Altenew Inks is the color collections they are available in. I also really love how nicely they stamp. Pastel colors are really difficult to get right as they have a tendency to get muddy looking, but Altenew's are awesome. I really like it that they have so many cool color palettes. My favorites are Rose Petal, Red Cosmos, Sea Shore and Cool Summer Nights. I have several sets of these and I'm thinking I need to get the rest of the cube collections; Red Sunset, Summer Afternoon and Warm & Cozy. I have the rest of the colors except the Warm Grays, but I have the cool greys and prefer them anyway. I don't use much Yellow or Orange but when you need it - you need it and it's nice to have the coordinating colors already done for you. For the cards I have here I used the lightest and 2nd lightest shades in the Rose Petal and Cool Summer Nights Collection. For the yellow flowers I used Papertrey Ink's Lemon Tart and Harvest Gold. The leaves are all done in Papertrey Ink's New Leaf Ink. For the ink blended background panels, I used the the 2nd lightest colors with a super light touch. These are incredibly easy to do on the watercolor paper I use which is Canson Bristol Watercolor Paper. Because I almost always use shimmer mist on my backgrounds, that just helps it to blend more. I always use Tsukineko Sheer Sparkle Shimmer Spritz or Tattered Angels Iridescent Gold Glimmer Mist. All together, I made 7 cards in Pinks, Blues, and Yellows with banners that were pre-cut and stamped. Most of the time I use Simon Says Stamp Antique Gold Embossing Powder so that is what I used to emboss ahead of time. Again, if I needed something different, I would have stopped to create what I needed. Thank you so much for stopping by my blog today. I hope you'll come back soon.